What Causes Substandard Plating Results? Any of these problems can lead to failures or shortened life of the part or worse, the entire system in which the part is used. Simply put, the plating and tinning company you choose has the power to make or break your project. The failure caused by poor plating or by misunderstanding your project's application can be a mere inconvenience or it could be catastrophic - a total system failure causing loss of life. At Hi-Tech Plating and The Tinning Company, our staff of highly trained and experienced engineers and operators, enable you, your company, and your customer to keep a competitive edge in design, development, and production. Contact us today to discuss your particular plating and tinning requirements and put our expertise to work for you. 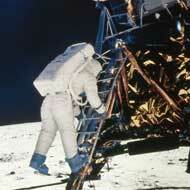 The first manned lunar landing had a problem descending the last 30 or so feet due to the failure of an altimeter. Ultimately, it was determined that the failure was caused because the wrong finish had been specified and the soldered joint that held the unit together cracked.